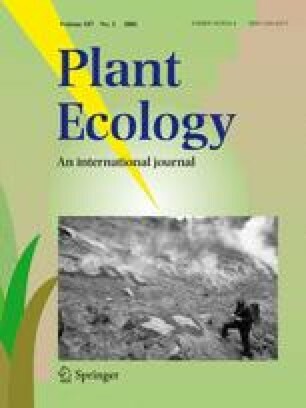 Recruitment, establishment and survivorship of seed- and vegetatively-derived shoots were quantified biweekly in annually burned and infrequently burned tallgrass prairie to investigate the contributions of seed and vegetative reproduction to the maintenance and dynamics of tallgrass prairie plant populations, the demography of seedlings and ramets, and the influence of fire on the demography of grasses and forbs. Clonally produced grass and forb ramets comprised >99%of all established shoots present at the end of the growing season, whereas established seedlings accounted for <1%,emphasizing the rarity of successful seedling establishment and the importance of vegetative reproduction in driving the annual regeneration and dynamics of aboveground plant populations in tallgrass prairie. Most recruitment from vegetative reproduction occurred early in the growing season and was higher in annually burned than infrequently burned sites, although low levels of new stem recruitment occurred continuously throughout the growing season. Peak recruitment on annually burned prairie coincided with peak recruitment of the dominant C4 grasses Andropogon gerardii and Sorghastrum nutans prior to prescribed spring fire, with a second peak in recruitment occurring following fire. On infrequently burned prairie, grass and forb recruitment was highest in early April and declined steadily through May. The naturalized C3 grass, Poa pratensis, was responsible for most of the early recruitment on unburned sites, whereas A. gerardii contributed most to recruitment later in May. Infrequently burned prairie was dominated by these two grasses and contained a larger forb component than annually burned prairie. The principal demographic effect of fire was on ramet natality rather than mortality. Fire regime, plant functional group, or timing of cohort emergence before or after fire did not affect ramet survivorship. C4 grass shoots that emerged early and were damaged by fire showed similar survivorship patterns to tillers that emerged after fire. Differences in species composition between annually burned and infrequently burned prairie are driven by fire effects on vegetative reproduction and appear to be related principally to the effect of fire and detritus accumulation on the development of belowground vegetative meristems of C4 grasses and their emergence dynamics.